So they're making a Robocop reboot (heh heh reboot, get it?) down in ol' Hollywood and in their infinite wisdom they've decided to make it a PG-13. I find that a bit odd. When you think back to the original among the many memorable scenes is Murphy's (spoiler alert) death scene where he is (spoiler alert) blown to pieces in the most terrifying and bloody fashion (it's also (spoiler alert) hilarious). Seems that a lot of the original charm of Robocop was the over the top ultra-violence of a robotic law man blowing criminals to kingdom come. This new one which I will admit has a lot of promising elements to it, Sam Jackson, Michael Keaton for example (and the suit doesn't look too bad either) has wimped out a bit. I reckon they want to sell a lot of Robocop toys and if its able to be shown to kids then they can sell more toys. I worry that they're missing the point a bit though. The R rated attitude of the original is one of its defining features, the bad guys are real sadistic bastards who get their comeuppance in a delightfully theatrical way. 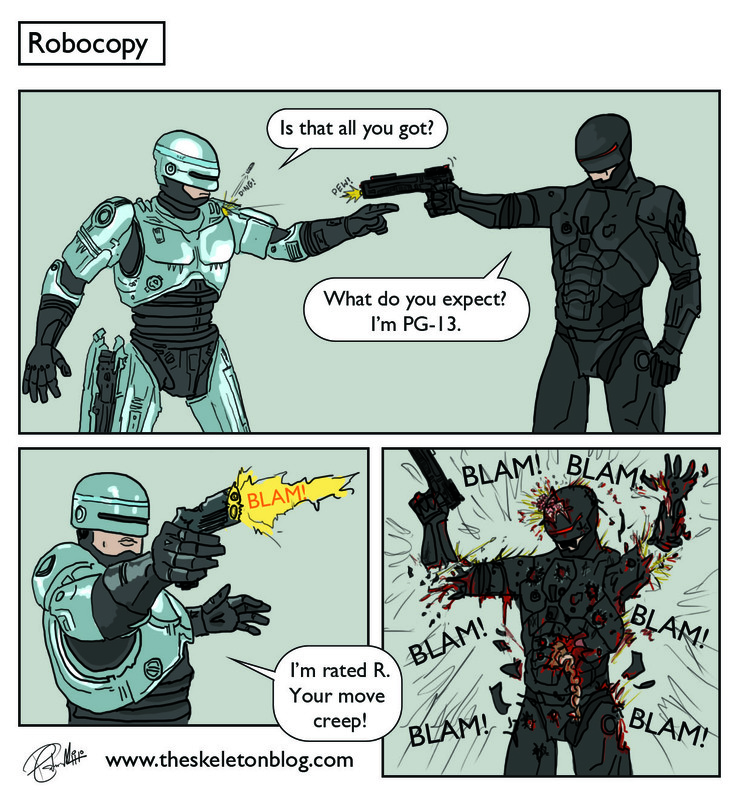 Making a PG-13 Robocop is like a family friendly 'Human Centipede' cartoon. It kinda misses the point. Ha ha! That is awesome mate! Do you mind if I share this link/pic over at 2000ad online? They have a Robocop thread there and I'm sure my forum buddy's would love that! Sure no probe glad you like it!